When spacecraft Dawn first beamed back pictures of an unusually bright spot on asteroid Ceres, space fans began waiting to hear what it could possibly be—something exotic perhaps? (In addition to the big one, scientists have discovered up to 130 smaller bright spots scattered around the rock.) Today two research teams have published studies on the asteroid’s make-up. The first team, from the Max Planck Institute in Germany, believes the bright spot is a type of salt: hexahydrite, which is a type of magnesium sulfate. It suggests that Ceres used to have a subsurface layer of salt water, which left the salt behind when the water turned to gas and escaped. 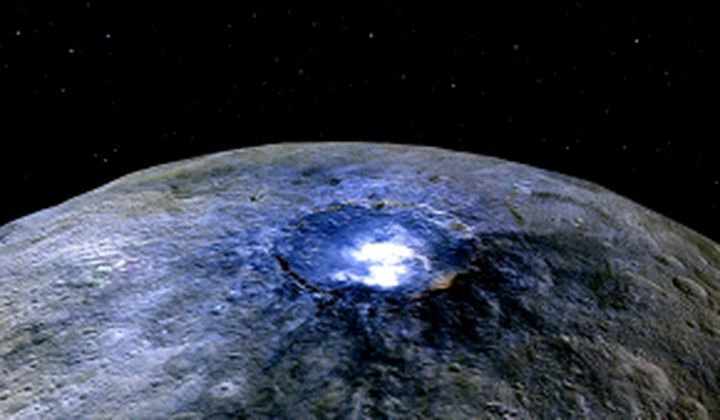 The second team, from the National Institute of Astrophysics in Italy, looked at Ceres' composition in general, detecting an ammonia-rich clay. But this would mean that Ceres formed in a place where it could gather nitrogen, so it’s possible that it did not form in the asteroid belt just past Mars where it now orbits. Instead it could have originated in the outer solar system, and moved to the belt later; or, it could have collected stable nitrogen ice from closer in, near Neptune.